Is there a real driver behind the wheel? 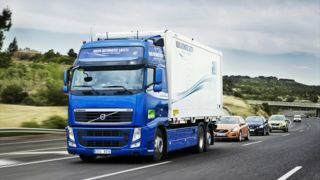 Head out on the motorways of Britain later this year and you might come across a self-driving HGV convoy or two: Chancellor George Osborne is expected to announce new trials of the technology in his upcoming budget speech, the BBC reports. The M6 in Cumbria will be one of the test sites, with an automated "platoon" of lorries led by a front vehicle carrying an actual real human driver. Apparently, the trials are going to take place on quiet stretches of motorway. The end goal is to cut congestion, government sources say. Up to 10 lorries could drive in tandem, using advanced mathematics and computer software to drive as efficiently and as close to each other as possible. Driverless trucks have already been tested in various locations across the world, including the United States and Germany, and it appears Osborne doesn't want the UK to get left behind - the new scheme is believed to be part of a larger funding boost for self-driving technology. Not everyone is convinced this is such a good idea: the AA's Edmund King told the BBC that the large number of exits and entrances on the UK motorway system made it impractical to have convoys of robot lorries clogging up the inside line. "We are planning trials of HGV platoons - which enable vehicles to move in a group so they use less fuel - and will be in a position to say more in due course," said a Department for Transport spokesman.